My work is symbolic of what is going on in my life as well as in the world around me, a constant search for the best way to interpret the ideas about the world in which I live. 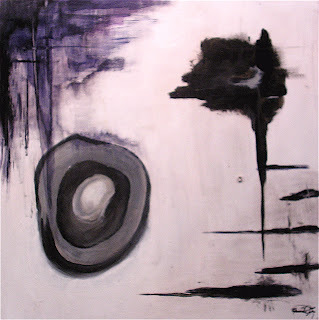 I define my work as abstract naturalism because it is based on the beauty and wonder I find in the natural world. When I begin a piece, I start with an inspiring image from nature or the human form and develop a rough sketch of the final creation. I enjoy the process of developing a final composition, discovering the final placement of images within the building of the background. It is exciting to explore the use of more illustration, and found objects in my new style of painting. My technique is to build a shifting, push/pull background, add collaged elements and illustration and build up layers until a final composition is achieved. 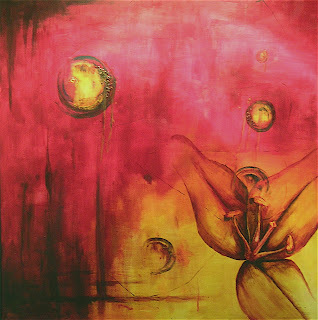 The overall purpose behind my work is to create art of beauty and interest. Please be sure to view the links at the bottom of the page. "Atmosphere" is a painting I created in a newer style I've been experimenting with, incorporating gel transfers, illustrations, and other collaged elements, like found objects. I used old, recycled wall paper and vintage images. I added drawn and painted figures both in realistic and abstract forms while still having the subject matter related to nature and forms. 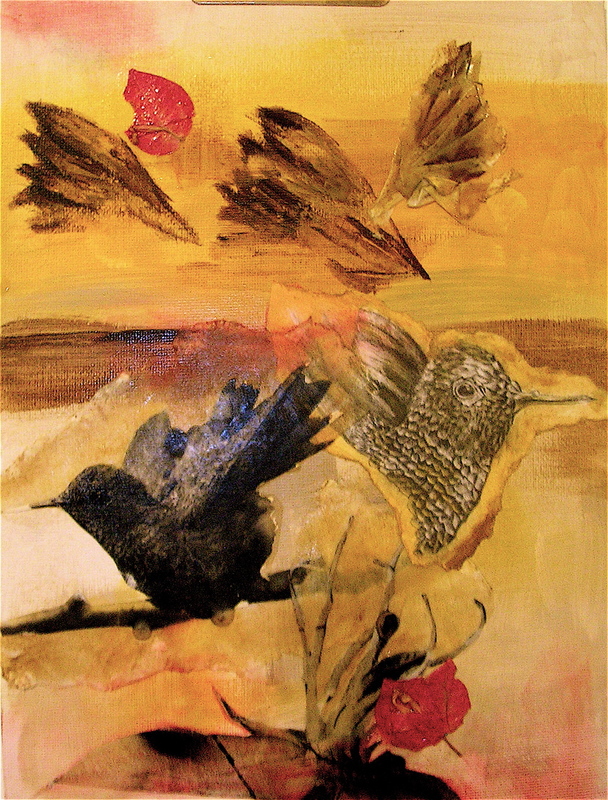 "Flight" is a painting I created in a newer style I've been experimenting with, incorporating gel transfers, illustrations, and other collaged elements, like found objects. I drew and painted both realistic and abstract forms while still having the subject matter related to nature. 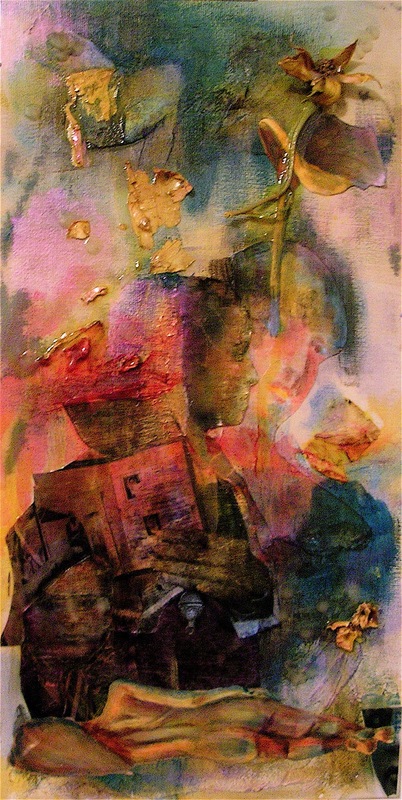 "Faces and Forms" is a painting I created in a newer style I've been experimenting with, incorporating gel transfers, illustrations, and other collaged elements, like found objects. I drew and painted both realistic and abstract forms and focused on a new subject matter of Women by using images from various places and historical times from around the world. 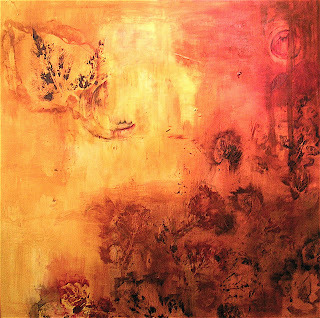 "Lily 1" is a painting that when I was in the beginning of planing out a composition I really wanted to focus on the bright, warm, bold color of red. 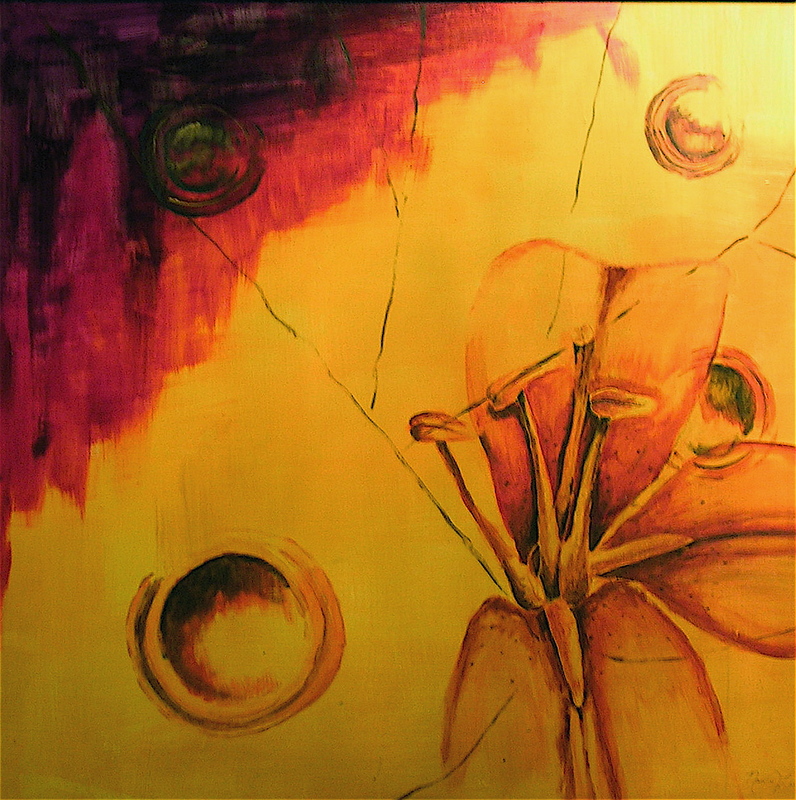 I began the painting by creating a push / pull space background, and then added abstract elements like the butterfly wing, and finished by painting a bold lily blending in golden hues. "Falling Leaves" is a painting where I focused on creating a feeling of the season of Autumn. I pressed a variety of actual leaves directly onto the painting and also painted several different leaves creating a sense of leaves falling and gathering on the surface of the painting. "Spring" is a painting in the seasons series. The season of spring, to me, is all about rebirth and renewal. I focused on fresh, clean colors, abstract forms in a circular shape to represent the eternal spiral of the seasons, and a large lily to represent the beginning of new growth. 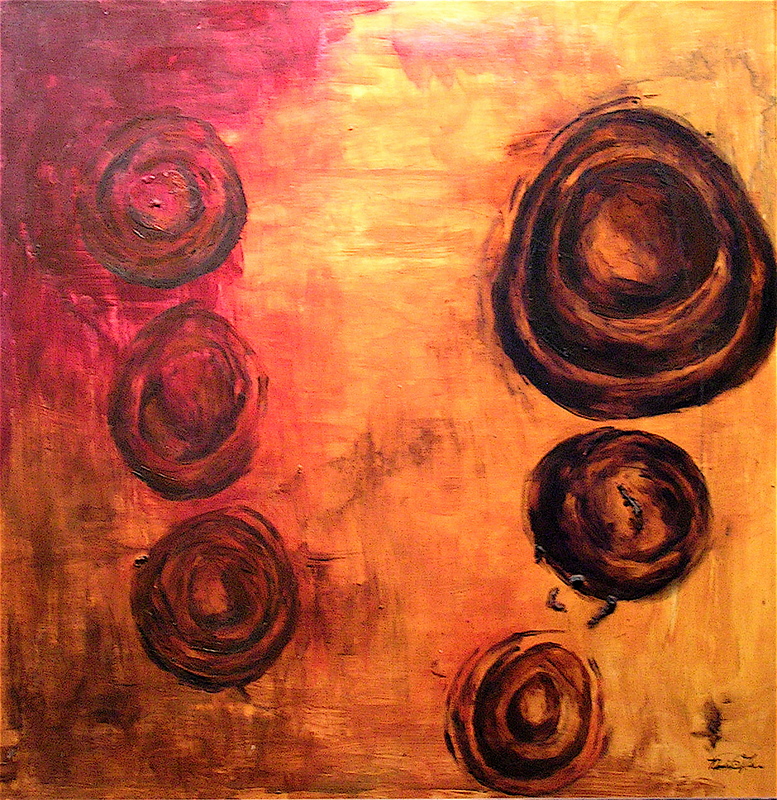 SOLD "Summer" is a painting in the seasons series. I began this painting by selecting colors that reminded me of the season of summer, focusing on golden hues and rich violets. I then worked in abstract forms in a circular shape to represent the eternal spiral of the seasons. I used actual flowers to create the images in this painting. I pressed flowers directly onto the painting and left any organic matter that stuck to the painting as part of the final piece. "Autumn" is a painting from the seasons series. I began this painting by incorporating a push / pull space in the background, while focusing on colors that remind me of the colorful season - Autumn. 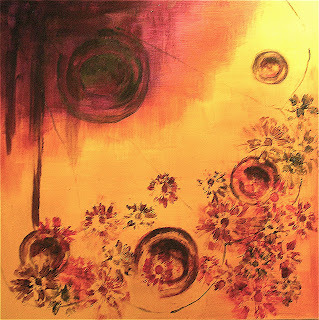 I then worked in abstract forms in a circular shape to represent the eternal spiral of the seasons. "Winter" is a painting in the Seasons series. It is a departure from the usual color scheme I had been working with at the time I was creating the series. I tried to capture the cold stark feeling of the winter season in a completely abstract way by working in abstract forms in a circular shape to represent the eternal spiral of the seasons.